oh, blog, how i’ve missed you! I have missed blogging so much (among other things). My life is moving is warp speed, which I’m sure is the case for most of you. Since November, I’ve been Acting Director at the fitness facility where I work. It’s been challenging, both professionally and personally. The holidays were good and I tried to separate work from home life, but I did find myself thinking about work too much while at home. My boys are growing up so quickly and they seem to change daily. The oldest will be 3 at the end of the month and the baby will be 6 months in a couple of weeks as well. They’ll be 18 before I can blink, I’m sure. I really am trying to enjoy every minute with them. Don’t get me wrong, there are moments that are trying when your two year old screams, “No, mommy!” when you try to tell him something to do, but thankfully those moments are fewer than the good ones. Help lead one person to Christ – No one came to me and said they were saved because of anything I said or did this year, but I hope I’ve witnessed more. I feel like I have been more comfortable in that over the past year. Perform at least one pull up – I give up on that one. I don’t think I’ll ever do that. Potty train our son – They say that happens on the kid’s own time. I have to add that back to the 2015 list because it has to happen this year or BUST! What’s goals have you set for yourself this year? I hope to make it back to blog before February…at least by Groundhog Day! I’ve not blogged in over a month and for that, I’m terribly sorry. I received a promotion at work so my life went from busy to extremely busy. Life is going by at warp speed. Last night, I was lying in bed and the baby (now 4 months old and 18 pounds!) woke up around 11 pm. He really didn’t need to eat that soon, so I got him adjusted with his pacifier. I was just dozing off when the house started to shake and I finally woke up wondering what the heck was going on. Then I realized it was some type of aircraft over our house. I said, “Mike!” (my husband’s name) and started looking out the window. I saw one aircraft go over and then another was behind it kind of zig-zagging along. It was very strange so late at night. The husband said one was an Osprey (I think the loud one). It was unsettling and disturbing. I ended up feeding the baby and laying there thinking too much. I thought about the mom who, at that very moment, was nursing her child with bombs going off around her. I wondered about folks who go to bed every night listening to planes fly over and fearing for their lives. How good we have it. How blessed we are. Even in the hustle and bustle of life and the busy holiday season, I think God finds ways for us to slow down and thank Him for his many blessings. All we have to do is listen. Folks show kindness in many different ways…some people wrap your desk in plastic & bubble wrap and put bright green sticky notes all over with sayings like “Beetlejuice, Beetlejuice” and “Don’t stop!” and “I am the great Cornholio!”. 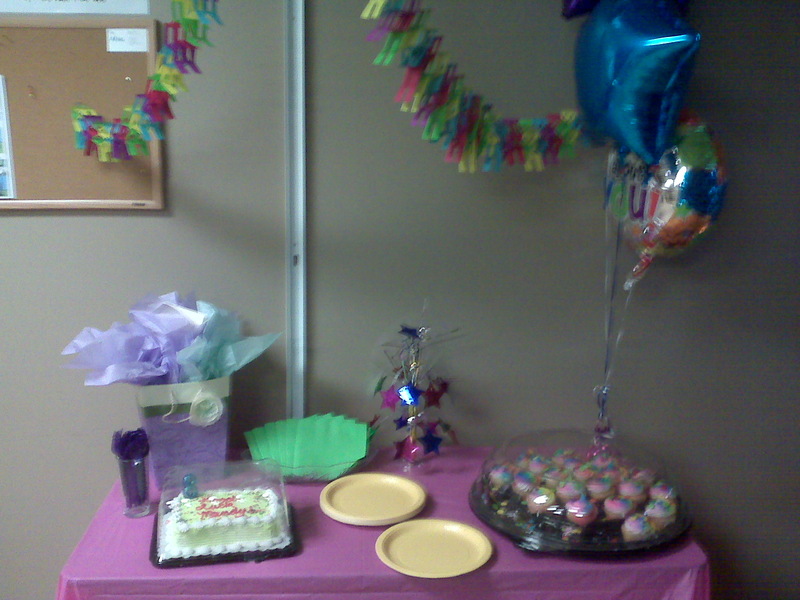 Others buy you cupcakes and bring you balloons. 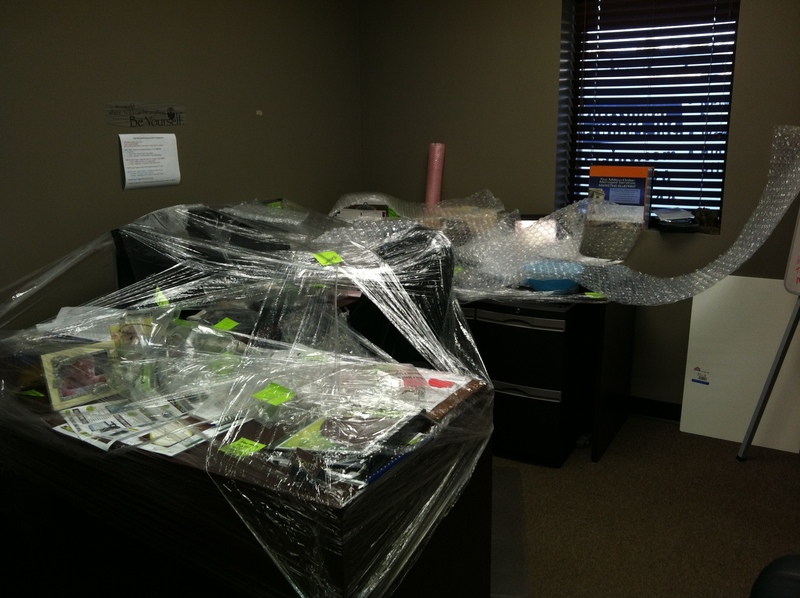 My co workers thought my desk might spoil or break so they wrapped it up for me. 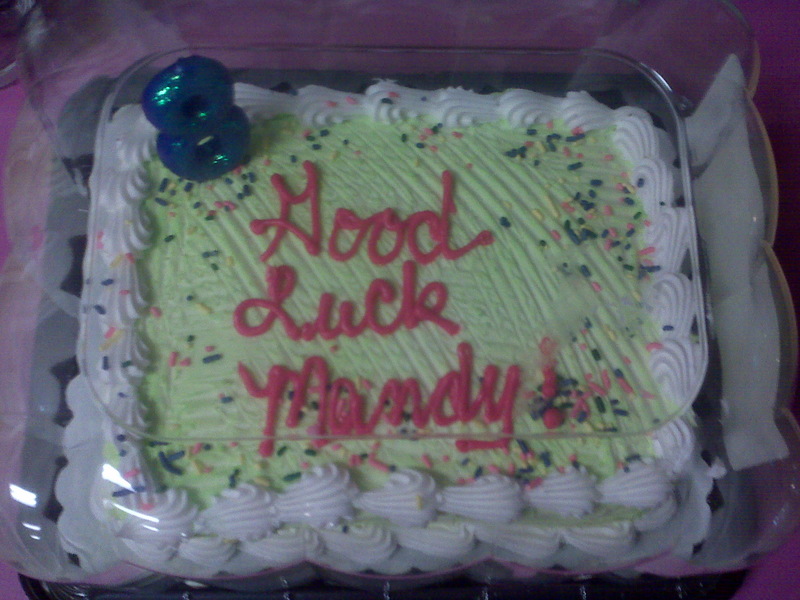 Good luck, Mandy! You’re 8 years old.